The studio is above the Greenbelt Federal Credit Union Bank and New Deal Cafe in Roosevelt Center. The door to the studio is next to the ATM machine on the outside of the bank. Reservations are strongly advised, classes fill up in advance and often walk-ins can't be accommodated. 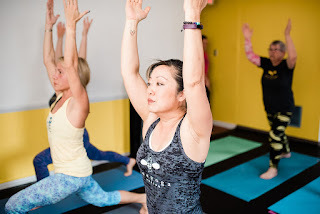 Bee Yoga Fusion is a non-heated yoga studio, maintaining a temperature that is comfortable to practice in a tank top if you desire. Boutique: We strive to provide high-quality products like t-shirts, tank tops, yoga mat carriers, jewelry, and yoga accessories and especially enjoying promoting locally made goods. Looking for a gift? We've got you covered! Parking: There is plenty of free parking in Roosevelt Center. To avoid being towed do not park in the spaces marked for 1 hour or 30 minutes. 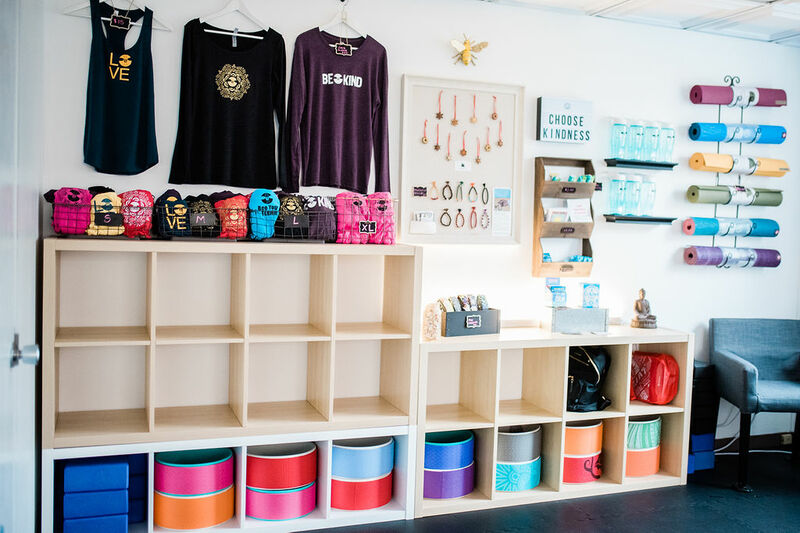 Arrive on Time: Doors to the studio and boutique open 15 minutes before the start of the class. If you have not arrived 5 minutes before the start of a class your space may be given to a walk-in. If you are running late please text Gretchen at 301-575-6339 so that she does not give your spot away. Students should not enter class after 15 minutes of the start of class, it is a distraction to the students who arrived on time. Cell Phones: Put phones on airplane or do-not-disturb mode, vibrate is a disturbance to the students who are in the back of the class. Practice Good Hygiene and Avoid Wearing Scents: Avoid wearing strong perfumes or colognes and do not skip deodorant. Bring Personal Items into the Studio: Take your shoes and jacket off in the hall and deposit your personal belongings in a cubby within the studio. Bee Yoga Fusion is not responsible for lost or stolen items. Health Concerns: Speak with the instructor about any health issues or concerns you might have; for example, knee replacement, pregnancy etc. before the class. Reservation Policy: If you need to cancel your class please do so in a timely manner. Space is limited and other yoga students desire the space to practice. Prepaid credit/money will be refunded if the booking is canceled at least 12 hours in advance. The prepaid credit/money will not be refunded if the booking is canceled less than 12 hours in advance, or in case of no-show. Bathrooms: There are two single person bathrooms for you to change into your yoga clothes, please arrive early so that everyone has the opportunity to use them. Kids & Babies at the studio: If your child can quietly read a book or play on their electronic device without prompts to be quiet they are welcome to hang out in the hallway on the bench, the studio door will be shut and the child will be out of eyesight. If your child can not sit quietly please do not bring them to the studio. If your child causes a disturbance to the instructor's teaching or the other businesses in the suite he/she will no longer be able to attend with you. Babies (non-crawling or walking) are always welcome to lay next to you on your mat. Children over the age of 8 are welcome to practice alongside you, please make your reservation for 2 people as your child will be taking up a mat space. Children attending yoga without a parent is on a case by case basis, email Gretchen@BeeYogaFusion.